I stumbled across something recently that stopped me in my tracks and I knew I HAD to share it with you! 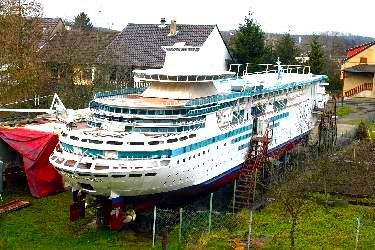 A gentleman in France named Francois Zanella, after getting sick of building the average size cruise ship models, decided to take things one step further and spent 11 years building a huge replica of Majesty of the Seas. It is 1/8th scale, 33.5 metres long, 4.75 metres wide and an impressive 100 tonnes. 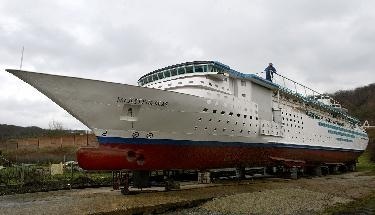 Francois started building the replica in his garden in Moselle, France, which is ironic as Majesty of the Seas was too built in France by Chantiers de l’Atlantique. If that wasn’t impressive enough you might also be surprised to know that the model is actually a fully functional canal boat and with a draft of 1.06 metres she is the perfect size to gain admittance to most European canals. Now some of you have may have already seen and heard of this as construction was actually completed in 2005 (he started building it in 1993) so we are going back quite a few years but for those of us who have just discovered it – amazing, right?! Once construction was complete the boat was carefully transported to Sarreguemines, in north-eastern France, where she was launched and christened. She is currently sailing her way through Europe with her creator living onboard full time. And here we all were thinking we had serious cruise ship problems because we have way too many branded t-shirts and hats, and in my case port and starboard socks!! I have to say this had completely passed me by. I nearly bought a massive model of a concept ship off eBay a few years ago, but this is something else. Scott, we could go halves lol! Awesome! I’d heard of it and seen a few pics, but I hadn’t seen the video before! I want one!